The day when the Tamil month of Panguni starts we observe Karadaiyan Nonbu. The time when this Nonbu is performed is at the time when Maasi Month expires and Panguni starts. Unlike Varalakshmi Nonbu which is celebrated by people who have this practice in their family, this is undertaken by all ladies. The reason behind performing this ritual is unique. It is believed that Savithri a woman in historical time fought with Lord Yama and got her Husband Satyavan’s life back from death. She prayed goddess Gowri and offered Adai made with rice and Karamani along with butter. Hence this Karadai is still been prepared during the Nonbu and offered to goddess during prayer. Sumangalis take head bath, wrap Madisaar Saree (Preferably Madi) and perform Kamakshi pooja. Before starting the Pooja the Neivedhyam is prepared and kept ready. 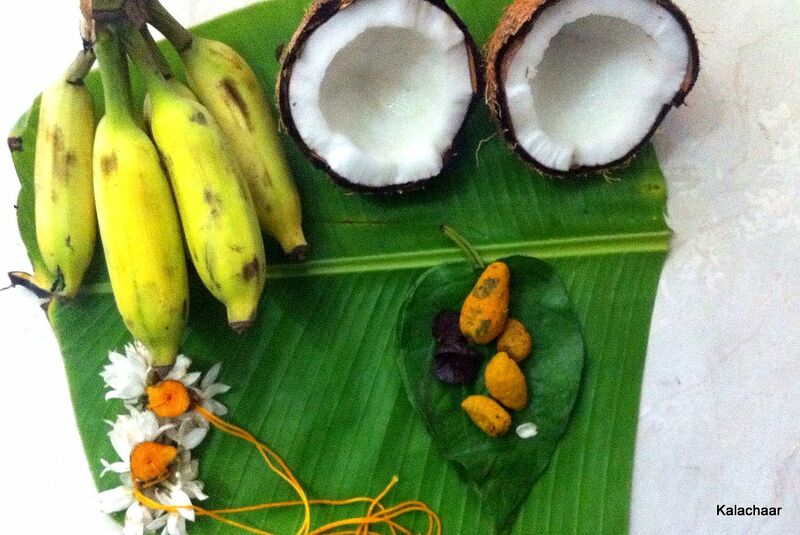 Also Betal leaves, Betal nuts, flowers for pooja and Sumangalis, Banana Leaves with Nuni are bought for the Pooja. Kolam should be drawn facing east/west. When there is only one woman do not put one kolam and do the offering. One pair of offering is preferred. Definitely, three numbers are not engaged. Two Sweet Adai will be kept on the Nuni Ilai and one spoon of Butter. The Manjal Saradu (Rope) is tied with Pasumanjal and/or Flowers and kept ready. One in front of Goddess along with Betal Leaves, Betal Nuts, flowers, Fruits (Banana), Coconut and one Saradu is placed for the Goddess. After Performing the Pooja, we have to do Neivedhyam of Adai placed on the leaves and then tie the rope around the neck. If husband is available at the time of Pooja, preferably husband ties that Saradu to his wife. If not, do it on your own or if unmarried your mom shall help you. Tie the Saradu kept for Goddess on the Idol or the Photo. When you perform the Neivedhyam below is the prayer that Sumangalis used to tell. Two pieces of adai placed in the Banana Leaf are shared between husband and wife. Especially, Sumangalis do not take Butter milk as part of fasting. Next day minimum one adai is kept and offered for the cow. Cow is worshiped by applying Kumkum and Turmeric on the back of it.